Hey! This week we’re taking a bit of a turn from my normal sweet posts! I’ve decided every once in a while to add a savory post, which will sometimes be a guest post or a post from me but it’s something I want to expand on while still mainly focusing on sweets. I think you’ll all like this post because its so adaptable and something everyone can make. I plan on making another post something like this one day soon hopefully. Behind the Scenes (BTS): Growing up I would eat a lot of one pot meals, it’s basically my mom’s specialty and now even though I make my own food I still revert to the classics. I am however, unlike my mother, a starch lover; I love rice, potatoes, pasta, you name it, so if a dinner has starch as the main component I’m already a happy camper, I also usually eat chicken or fish in my dinners not so much beef or pork, just the way I was raised really and I didn’t like the way my mom made pork but as an adult I’ve found ways that I prefer to eat it. Anyway, when I was 16 I transferred schools to a technical vocational school that had a variety of trades taught, mine was culinary where I learned about the mother sauces and béchamel was one of them. 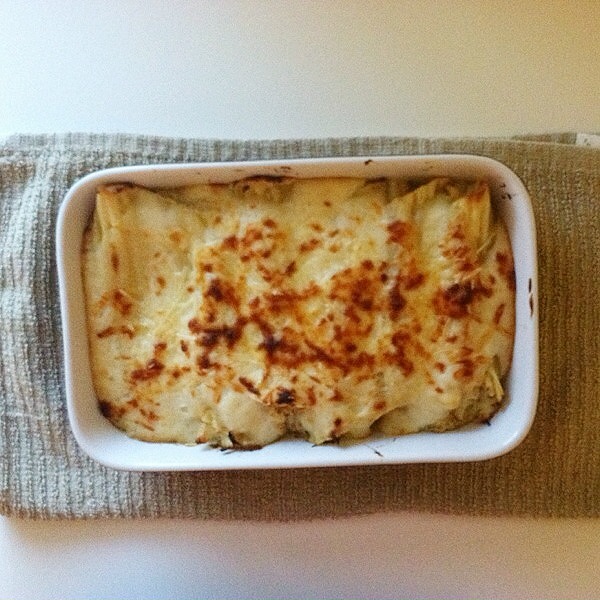 I like béchamel because it is so moldable and the whole combination of this dish worked well with a sauce that didn’t have a heavy flavor all it’s on. Béchamel Sauce 101: Béchamel is a white sauce made from a roux (butter and flour) and milk. It doesn’t have much flavor but that’s what so awesome about it because its a blank canvas open to countless ways to give it flavor. In this specific recipe we’re making it a bit spicy, but if spice isn’t your thing you can simply omit it and leave it a bit plain since we have a lot of cheese in this recipe as well. You should know that the roux is simply a thickening agent. The butter is the fat and the flour is what the fat attaches to when cooked; it’s basically like gelatin for savory food and since milk on its own is very loose the roux thickens it up turning it into a sauce. Adjustments: If you’re looking for adjustments that can be made for this dish a meat substitution is beef, shredded or ground is fine, about a pound. You could also use pancetta instead of chicken or beef , 1/2 pound should be enough to make the dish meaty or you could simply omit the meat all together and add some more cheese, preferably shredded tougher cheese like Parmesan, Mozzarella etc. 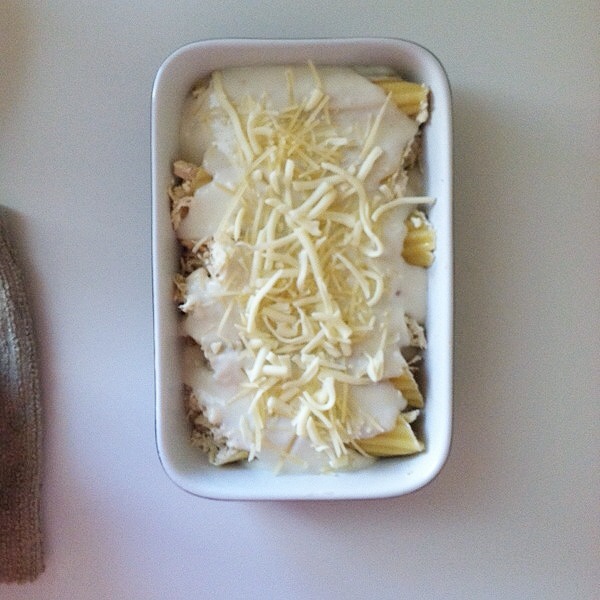 All of the cheeses can be substituted and the ricotta should be substituted for another thick smooth cheese. The béchamel sauce however is a tricky one to adjust. I don’t really know of another sauce you could replace it with other than Alfredo sauce. Alterations: I made this dish for myself and my roommates so it doesn’t make much, maybe 6 to 7 manicotti so if you have a big family then you might want to double this recipe, if your household is smaller than mine, there are 4 of us total, you could half it no problem. Sauce: When it comes to the sauce you don’t want to cook it over high heat, even if you’re in a rush, it could curdle the milk and it will taste nasty, spoiled and sour. I suggest medium heat at most! You should also have you milk heated as well, it startles the milk if you have such a cold dairy ingredient going into a hot mixture. Stirring frequently is also a must! preferably with a whisk; you don’t want the flour to clump up or the mixture at the bottom of the pot to burn so make sure the sauce is constantly moving. Chicken: If you want you could buy already roasted chicken to save time, I rarely do that because I love my chicken dry, I joke that I cook my chicken so long that it comes back alive and dies again. In most Caribbean families they tend to cook it out that long because it’s better than the other option which is under-cooking it, so it’s just what I grew up with. ALSO! Chicken should be cooked to 165F/75C MINIMUM! Ta-Ta-For-Now: Well this was fun and a little nerve racking. I have no idea what type of information to give you all in terms of savory foods so if you have any questions please write it down in the comments section and I will answer them. 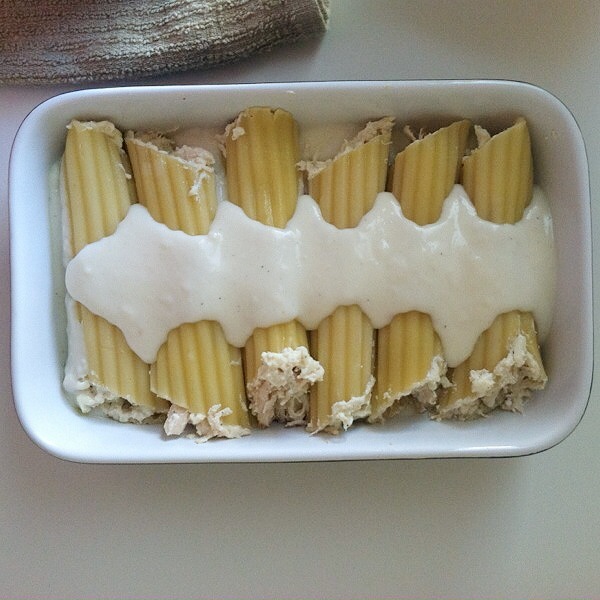 Thanks for reading and I hope you enjoy this recipe! Roasted Chicken 1, 2, 3: The first thing you need to do when making the chicken is cleaning the chicken, in a large bowl pour about 2 cups of distilled white vinegar and about 1/2 cup of water and rinse your chicken in the liquid mixture, once fully cleaned pat dry with paper towel and pour dry seasonings onto the chicken and rub. If you want you can marinate it over night or you can put it in the oven right away. In a 375F/202C oven baked for 1 hour, check after 45 minutes. 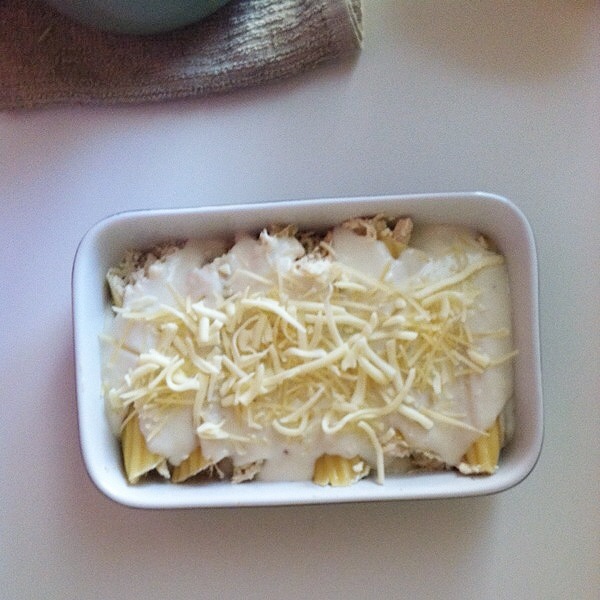 Cheese Filling: In a small bowl mix your ricotta, egg, mozzarella, parmesan and other seasonings and set aside. Once your chicken has baked and cooled shred the chicken with a fork and combine with the cheese filling mixture and set aside. Pasta: In a large pot filled with boiling water add about 1 handful of salt. 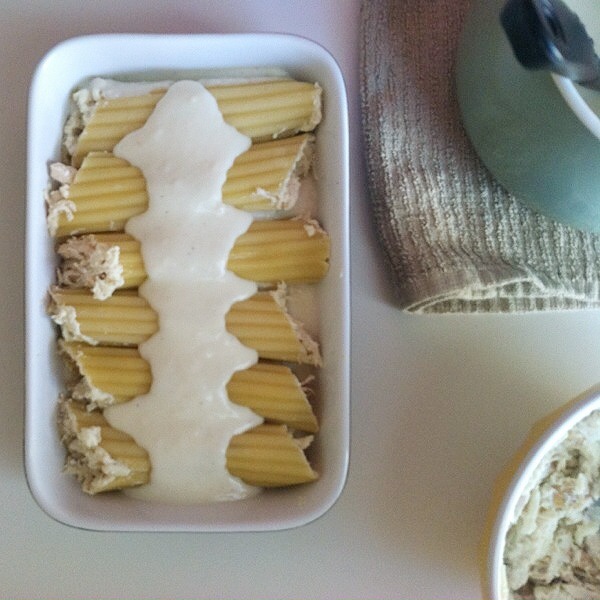 Put your manicotti into the water and cook for 7 to 8 minutes. Set aside and proceed to make your béchamel. Béchamel Sauce: In a small sauce pan over medium heat pour your milk in and let it heat up, in another small sauce pan over medium heat melt your butter, once fully melted at your flour and cook for 1 to 2 minutes until it smells a bit toasty. Proceed to add your heated milk to the roux (flour and butter mixture) slowly. I would suggest one ladle full at a time and stir with a whisk until fully combined, once all the milk is in the roux mixture add your salt, pepper and pepper flakes then continue to stir frequently until roux is thickened. This takes about 5 to 10 minutes. 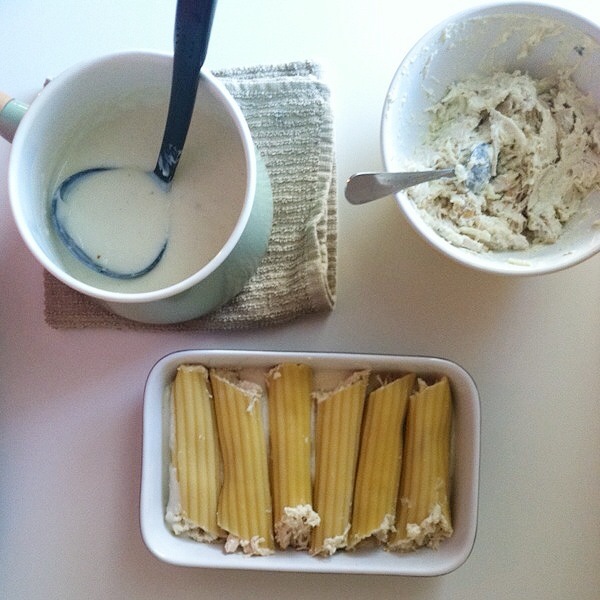 Assembly is Required: Butter the dishware you will be putting the manicotti into. 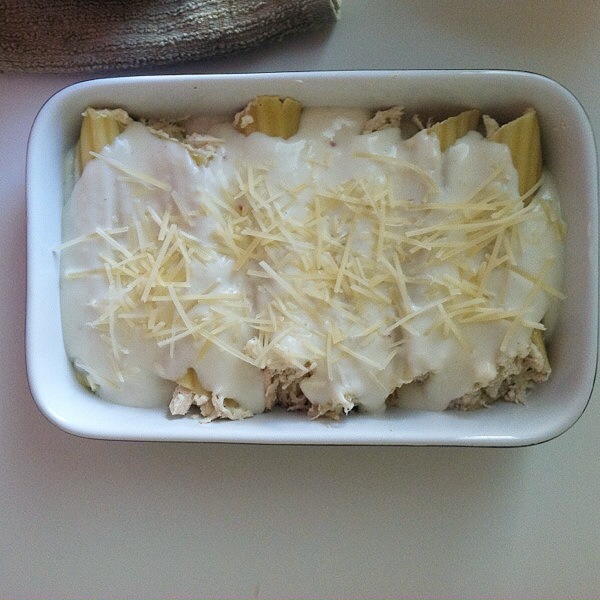 Take a small spoon and start to fill the chicken and ricotta mixture into your manicotti pasta. 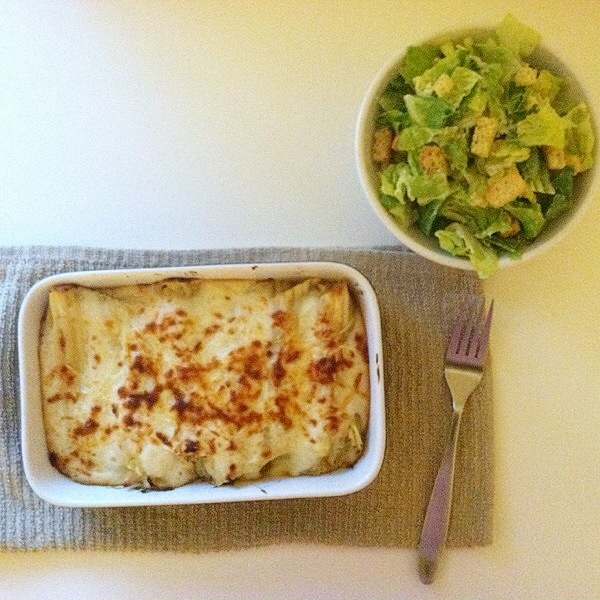 Once all manicotti are filled take your béchamel and pour a small layer onto the bake ware dishware your using, them lay each manicotti in the dishware once all are in the dishware proceed to cover your manicotti with the remainder of your béchamel sauce. Once fully covered sprinkle some extra parmesan and mozzarella over the sauce. Bake and Eat! : Proceed to put your dinner into the oven (if you’re not going to eat it right away you can put it in the fridge for up to 2 days max and then put it in the oven.) at 375F/202C and bake for 20-30 minutes, for the last 3 minutes turn your oven onto broil to crisp up the cheese top. Let it cool for about 15 minutes and enjoy with a salad, vegetables or a side of your choice.